The dry-balls cannot possibly learn a thing every starfish knows in the core of his soul and in the vesicles between its rays. It is my sincere belief that every student aspiring to be a biologist, especially those undertaking a field course in biology, should be required to read the philosophy that Steinbeck (1941) describes. This course provides an introduction to the basic biology of insects. It includes sections on morphology, physiology, ecology, classification and control of insects and related arthropods. Insects are incredibly important to the earth’s ecosystems. They often dominate food webs in terms of diversity and biomass. Many insects are intimately linked to humans in both beneficial and detrimental ways. Bees for example provide us with food, honey, and pollination of plants, all examples of benefiting society. On the other hand some species of mosquitoes are the most dangerous animals in the world when it comes to man. Insects through the diseases they vector have greatly influenced the outcome of wars and world history. This course is taught every fall semester. AQUATIC INSECTS is a basic course in the taxonomy and biology of the insects that live in freshwater habitats. The course emphasizes the identification of aquatic insects and important aspects of their biology such as life cycles, habitat preferences, feeding habits, adaptations to environments, and functions in ecosystems. It is primarily intended for persons interested in careers in aquatic ecology, and environmental science. UNT has a long tradition in the aquatic sciences and the study of aquatic insects has been a focus at UNT for nearly 50 years. Past students in this course have developed successful careers in education, state and federal conservation organizations as well as in private industries. This course is taught during the spring semester of years ending in an even number. 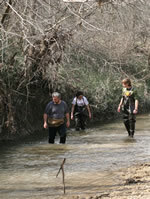 The course is designed to provide tools that can be applied to evaluate the ecology flowing waters. The goals are relatively broad and we hope to provide an awareness of many areas and issues both from an applied and basic science perspective. Because of our location, we will be biased in using examples from prairie streams and rivers; however, we will discuss characteristics of streams from other ecoregions to familiarize you with scales, patterns, and processes in the absence of direct experience. The laboratory and lecture are highly synchronized. I firmly believe that you can’t learn ecology from reading a book and accordingly place an equal value on the lecture and laboratory. There is one overnight field trip that is required attendance. This course is taught in the spring semester of years ending in an odd number. 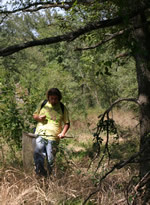 We are currently seeking student lab assistants to process biological field samples.